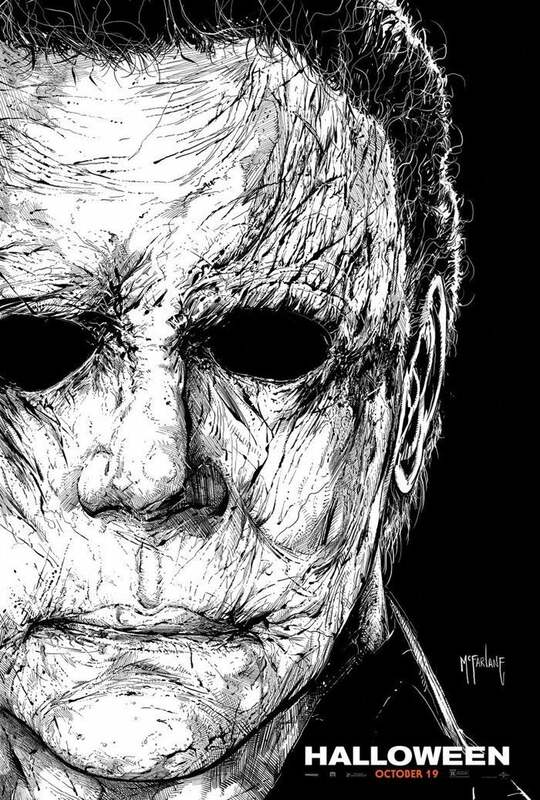 Iconic comic book creator Todd McFarlane is taking a crack at one of the most iconic figures in the world of horror by crafting an all-new poster for the new Halloween, depicting the emotionless visage of Michael Myers. Check out the poster below, which is an exclusive for those attending this weekend's New York Comic Con. While the Halloween franchise isn't necessarily known for its bright colors, the starkness of the above image reminds audiences of how lifeless Michael Myers is, thanks to the use of his impromptu disguise. The original Halloween saw Myers escape from a mental institution and steal a mask from a hardware store to disguise his identity. The film's crew famously took a William Shatner mask and distorted it beyond recognition, creating an iconic visage. The mask has looked different in the franchise's many sequels, with some versions being more bizarre looking than others. This new film is set to be a continuation of the events of the original film, meaning the mask featured in this sequel is intended to be the same disguise as what we saw 40 years earlier. "The film takes place 40 years later, so you’re not going to have that same mask, it’s not going to be this pristine, beautiful thing that it was in 1978. You have to approach it from that standpoint," makeup designer Christopher Nelson shared with Halloween News Daily about the new mask. "I had 40-year-old masks that I studied and looked at how they broke down, how they wrinkled, how they did this and how they did that. I also took into account the context of the film. Where is the mask now and where has it been for these 40 years?" The new Halloween is almost here! But if your anticipation is through the roof, and you impatiently want to see even more footage, these Halloween clips might hold you over. I don’t want to tell you to not watch something, and as far as spoilers go, these two clips are very light. But if you want to go into the latest Halloween movie fresh, knowing as little as possible, perhaps you should steer clear and wait it out. If not, watch the new Halloween clips below. I really hope the new Halloween movie doesn’t go overboard with clips. Not for my sake – I’ve already seen the movie. I just would hate for too much of the film to be spoiled before more people get a chance to experience it. In any case, here are two Halloween clips, should you want to watch them. First up is our modern-day introduction to Laurie Strode (Jamie Lee Curtis). A group of true crime podcasters (don’t laugh!) have come across the pond to do a special devoted to Michael Myers, and they also drop by Laurie’s fortress-like house for a quick interview. The podcasters are trying to understand why Michael did what he did all those years ago, and Laurie is blunt: there’s nothing to understand – Michael is just pure evil. Next: Laurie talks to her granddaughter, Allyson (Andi Matichak). Laurie has become a pariah in her family, alienating her daughter Karen (Judy Greer), Allyson’s mother. Allyson is the only family member left who really talks to Laurie, and tries to understand where she’s coming from. Here, Allyson urges Laurie to let go of the past, and her obsession with Michael Myers, and move on. Easier said than done. Again, these clips don’t give too much away, but please, powers that be: don’t go overboard. The film is almost here, everyone can wait a few more weeks without anymore clips. Now that I said all that, here’s a new image from the film. It’s slightly more spoiler-y, so beware! The latest Halloween film doesn't hit theaters for two weeks, but buzz around the project is so strong that the film is projected to earn a franchise-best opening weekend. Possibly as a response to that excitement, Bloody Disgusting claims that Blumhouse Productions has already begun to develop a follow-up film. The site claims that their sources revealed that Danny McBride and David Gordon Green, who wrote this latest film, won't be involved in the next chapter. An unknown writer is rumored to be developing the project. Another interesting point that the site notes is that, with filming for this most recent film having begun in January with an October release, it's possible that, were things to come together quickly, it wouldn't be out of the picture for a new film to hit theaters next October. This upcoming film premiered early in September and has much more riding on it, with a potential sequel likely being able to come together in a smaller window of time. News of a possible sequel doesn't come as much of a surprise, especially given that McBride and Green had initially conceived of their project as a pair of films. Producer of the latest film, Jason Blum, has teased on multiple occasions that he's at least open to the idea of sequels, though he has also noted that the more important issue was making sure this year's Halloween would be a success. Between this new film's current Rotten Tomatoes score of 85 percent positive reviews and its projected box office, it looks like Blum needs to start putting some thought into what a Halloween sequel could look like. The new Halloween hits theaters on October 19th. Are you excited that a new Halloween might already be in the works? Let us know in the comments below or hit up @TheWolfman on Twitter to talk all things horror and Star Wars! Halloween comes early this weekend as the new Halloween movie opens in theaters. With the opening just days away, new reviews have started to appear. So far, it sounds like the film is going to be a welcome return to form for the venerable slasher series. Halloween is directed by David Gordon Green from a script he co-wrote with Jeff Fradley and Danny McBride. Jamie Lee Curtis returns to the franchise as Laurie Strode, as does original Michael Myers actor Nick Castle. They’re joined by Judy Greer, Andi Matichak, Will Patton, and Virginia Gardner. Keep reading to see what critics are thinking about the new Halloween movie. Halloween opens on October 19th. With the new Halloween film stalking its way into theaters this weekend, Michael Myers has finally come back home. One more time, the Shape will come face to face with his longtime nemesis Laurie Strode, played by a returning Jamie Lee Curtis. 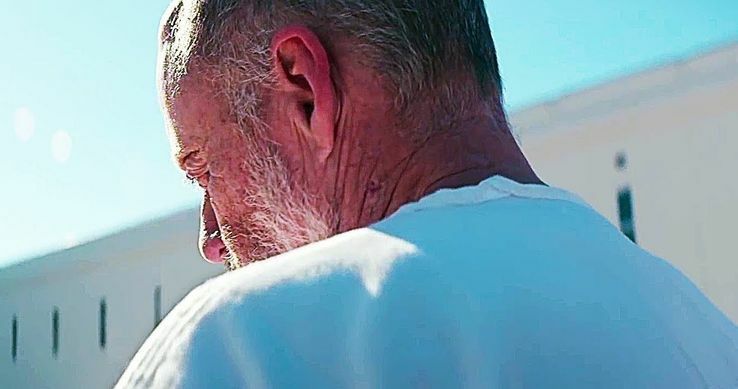 Ahead of the film's official premiere, a newly-released teaser video from the film gives viewers their best look yet at Michael Myers, since the character was unmasked in the original film four full decades ago. You can take a look at the video down below. In the clip, two true crime podcasters (Rhian Rees and Jefferson Hall) confront Michael in the insane asylum where the boogeyman has been locked up for the past forty years. They attempt to garner some kind of reaction from Myers by dangling his trademark mask, pleading for him to just take a look at it. Keeping his back to the duo, Myers slightly turns his head, giving fans a little peek at the murderer's face before he soon enough wears the mask once again. There's oddly something really creepy about the scene, which serves as a great way to set up what happens next. With an amazing attention to detail, the unmasked Michael Myers is played by actor Tony Moran. While Nick Castle portrayed the masked version of Michael Myers in the original film, it was Moran who stepped in to play the Shape when he's unmasked by Laurie Strode. Even if we're not given as good of a look at Michael's face in the new movie as we were in the 1978 film, the fact that the same actor was cast shows just how faithful this sequel will be to John Carpenter's original. Castle is returning to play the role in a cameo appearance as well, sharing the role of the masked Michael Myers with James Jude Courtney. In Halloween, Laurie Strode confronts Michael Myers one last time, intending to kill the boogeymen to keep her family safe. Having trained for the past forty years while anticipating his inevitable escape, Laurie is going to be ready for him this time. Joining returning star Jamie Lee Curtis in the cast are Judy Greer, Andi Matichak, Will Patton, and Virginia Gardner. Original director John Carpenter has also returned to the franchise to serve as an executive producer, also composing the score with son Cody Carpenter and Daniel Davies. Directed by David Gordon Green using a script co-written by Green, Danny McBride, and Jeff Fradley, the new film is on track to make killer profits at the box office. Early predictions have the film making upwards of $50 million, which could generate the start of a new slasher film boom in Hollywood. A sequel is reportedly already in the works, so it looks like Michael Myers could be here to stay. The film officially premieres in theaters everywhere as of Oct. 19, 2018. You can watch the face-teasing preview video below. This information comes to us courtesy of ComicBook.com.